Drills for the Indoor Range, 1: Handgun Warm-up & Skills Evaluation | Eagle Gun Range Inc. So there you are, standing in a narrow, walled lane at an indoor range. The range rules are stringent: no drawing from a holster; no rapid fire or “double taps” because max. 1 shot/second; no multi-target shooting. This is all very well and good if you’ve come just to stand there and slowly practice your no-stress trigger discipline, but what if you want to train? Despite what some might think, you can engage in valuable training in the highly constrained confines of the walled lanes of an indoor gun range. These sorts of drills cannot replace the valuable opportunities offered by a practical/tactical outdoor range, but they can greatly augment that practical training. The point of a warm-up is to refresh your intuitive response with proper fundamentals and to better establish physical habits and the technical tone of your training. If you neglect regular attention to stance, body attitude, grip, sight picture, breath control, trigger control, and follow through your training will become a corruption rather than an opportunity for improvement. As fits with most indoor range rules, you’ll be working from the bench and not from a holster on these drills. You will, however, be executing reloads from concealment. Even though the drills are generally appropriate for an indoor range, be sure to adhere to your specific range’s rules. If you’re not sure if a particular drill is appropriate for your range, ask your range safety officer. Regardless of the gun handling required by a drill, be sure to keep your muzzle pointed downrange at all times. None of these drills require any deviation from this important rule. While it’s true you don’t get a warm-up when the crap hits the fan and you have to defend yourself, this is training to build skill competence. A smart individual tests skills and competence boundaries, too, but here I’ll be referencing skill building only. I recommend that you engage in at least one warm-up drill to begin your range training session, no matter what other training you have planned for the day. During warm-ups, pay particular attention to stance, body attitude, grip, sight picture, breath control, trigger control, and follow through. This is your chance to define the quality of your day’s training. A 5×5 array of 1” targets; either hand drawn or printed. Make your own in a graphics program or use a Sharpie to draw it on the back of a typical target (far easier). Pistol or revolver, 50 rounds of ammunition. This drill consists of 5 sequences. In each sequence you will fire 10 shots: 2 shots each into the five 1” circles on a row or column (the target is 5×5 so you can choose to address rows or columns in your warm-up). Since your magazines are loaded with only 5 rounds, each sequence requires a magazine or speedloader exchange. The objective is to hit the center of each quarter-sized circle twice, resulting in either one hole or two connected holes (keyhole). The sequences are untimed. Place the target at 3 yards. Start with 2 loaded magazines (or speedloaders for revolver), 5 rounds in each; one in the gun and one concealed where you would normally carry a spare (even if you do not carry concealed, practice like this anyway). The starting position is low ready or compressed ready (your choice). Start with your gun held in both hands, in low or compressed ready position. Bring your gun up on target and fire two rounds at the center of the first circle (slowly, deliberately, and with good follow through after each shot). Move to the next circle and fire 2 shots. On the third circle your gun will run empty after 1 shot. Perform a speed reload and fire the second shot. Finish the last two circles, 2 shots each. Your gun will run empty at the end of the row or column and your slide will lock back (for autoloading pistols). Remove the magazine and place your open pistol down on the bench (revolvers: cylinder open). 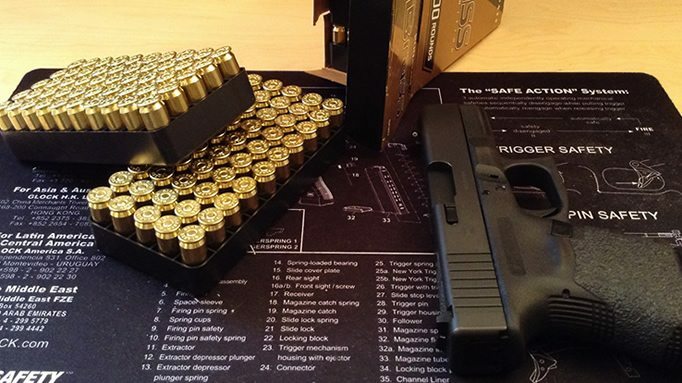 Reload your magazines or speedloaders with 5 rounds each and repeat for each sequence (5 in all). Slightly increase your firing rate and decrease your time between circles with each successive sequence (but do not exceed your range maximum firing rate). Be sure to maintain your good grip—no “milking” the grip between shots. Notice and record in your notes (always keep training notes) the number of misses and non-connected hit pairs you have. In the days/weeks to come, work to reduce the number of non-connected (keyhole) hit pairs. If you consistently have 50 good shots with this drill, all with connected hit pairs, consider moving the target from 3 yards to 4 yards, etc… Alternately or additionally, consider returning to ready position after each 2-shot circle in order to practice good/quick target acquisition. Note that adding difficulty to this drill is in no way required! Even if you consistently ace the drill, it still provides good value to your training when performed at the closest distances and in slow, deliberate manner. I found the basis for this drill on the Tactical Professor and use it myself every week (and almost every time I train at the range). By the way, I highly recommend that you follow his blog. Great stuff there! Any silhouette target; B-27, B-21, Q, IDPA, IPSC, etc. – or – a plain 7” circle or diamond target (maybe hand drawn on the back of any regular target—that’s what I use). Regardless of which target you use, regard a 7”x7” area of the high chest as the scoring area. This drill consists of 5 sequences of 10 shots each, performed at 3, 5, 7, 10, and 15 yards. The sequences are untimed. Start with 2 loaded magazines or speedloaders, each loaded with 5 rounds. One in the gun and one carried where you’d normally carry a concealed spare (even if you do not carry concealed, try it anyway). The starting position is low ready or compressed ready (your choice). For double action pistols, you will decock after each step. Start with handgun held in both hands, in low or compressed ready position. Spare magazine loaded with 5 rounds or speedloader with 5 rounds, concealed per your normal carry method. Bring the handgun up on target and fire 1 shot at the center of the target. Follow through for one second and then return to ready position. Bring the pistol up on target and fire 2 shots at the center of the target. Follow through for one second and then return to ready position. Bring the pistol up on target and fire 3 shots at the center of the target. After two shots the pistol will be empty. Perform a speed reload from concealment and fire the third shot. Follow through for one second and then return to ready position. Bring the pistol up on target and fire 4 shots at the center of the target. After the shots, the pistol will be empty. Hopefully, the slide has locked back if it’s an autoloader. Place your open pistol down on the bench (revolvers: cylinder open). 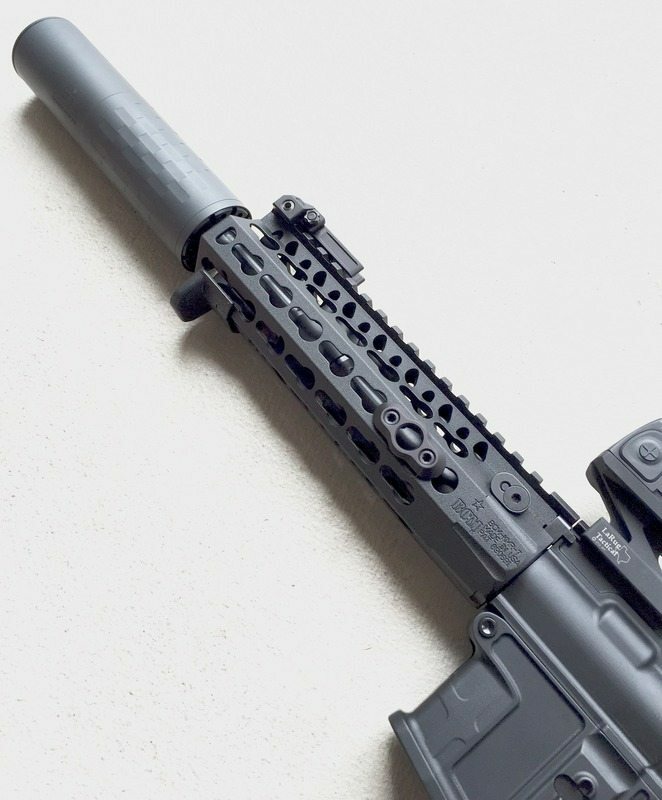 Send the target out to 5 yards and reload your magazines with 5 rounds each (and repeat the sequence at 5 yards, then 7 yards, then 10 yards, and then at 15 yards). Notice and record in your notes the range at which you first hit outside of the scoring area—and—how many hits are outside of the scoring area. In the days/weeks to come, work to extend the range at which you hit outside of the scoring area and reduce the number of non-scoring hits. As you improve and keep all hits in the scoring area, increase your rate of fire (up to the range maximum), but remember this is just a warm-up so this augmentation is not necessary. We’ll cover more drills in upcoming articles. For each of these warm-ups, pay attention to the speed, smoothness, and overall competence with which you execute the magazine exchanges. While not necessarily the point of these drills, magazine-exchange competence is something you should work to continually improve. They’re useful for basic gun-handling competence, competition (if you decide to try that), and might even save your life one day. Treat them as seriously as every other aspect of your training and find ways to incorporate mag exchanges into your training drills. In future articles I’ll share non-warm-up drills that can stretch and test your gun-handling and marksmanship skills. Stay tuned. Thank you so much for sharing your training methods. I will definitely add this to the things I already do. This definitely appear to be something I’ll enjoy doing. Appreciate Andy’s articles and info. Got this site bookmarked. Great knowledge.